Creating Precision Robots: A Project-Based Approach to the Study of Mechatronics and Robotics shows how to use a new “Cardboard Engineering” technique for the handmade construction of three precision microcomputer controlled robots that hit, throw and shoot. 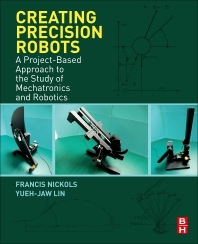 Throughout the book, the authors ensure that mathematical concepts and physical principles are not only rigorously described, but also go hand-in-hand with the design and constructional techniques of the working robot. Detailed theory, building plans and instructions, electric circuits and software algorithms are also included, along with the importance of tolerancing and the correct use of numbers in programming. The book is designed for students and educators who need a detailed description, mathematical analysis, design solutions, engineering drawings, electric circuits and software coding for the design and construction of real bench-top working robots. Professor Nickols has taught at universities in the U.K., Hong Kong, Singapore, Malaysia, Brunei Darussalam, and China. Prior to his academic career, he worked as a Researcher and Product Design engineer in the Ford Motor Co. UK, Lucas Microelectronic Automotive Control Systems, UK, American Machine and Foundry, (AMF) UK, Renishaw Research and Transducers, UK, and Danfoss Flowmeters, UK. In 2009, he was awarded 1st prize for the most innovative engineering product invention for the Crown Prince award in Brunei. At Nanyang Technological University, Singapore, he was personally responsible for the detailed design and construction of an all-wood automobile that led his team of students to win 1st prize Design, 1st prize Safety and 2nd prize Fuel Economy in the Diesel engine category of the Shell Eco Marathon Asia 2014. His research interests concern (i) bench-top robots for mechatronics engineering education and, (ii) biomimicking robot muscles, for which he has recently been granted a US patent dated 16 May 2017 No.9,653,962. He is a fervent proponent of high quality engineering education attested by the innovative robots that he designs and builds thus creating highly effective custom-built teaching and learning materials for students. Professor Y.J. Lin was appointed as Associate Provost for Global Engagement in August 2016 after three years of service as Dean of the Faculty of Science and Engineering at UNNC. Before joining UNNC, he was Professor and Department Chair of Mechanical Engineering at the University of Texas in Tyler from 2008 to 2013. He has also taught at the University of Akron in Ohio for twenty years. He worked in the electrical appliances industry as a design engineer for several years in Taipei before he went abroad to the U.S. for his postgraduate education. In his academic career over two decades, Professor Lin has built up rich research experience in mechanical design, structural mechanics, and control engineering that has grown into engineering application areas leading to aircraft health monitoring, de-icing, and more recently, to the design of nano-devices for energy harvesting. YJ has been on the editorial advisory boards of three international journals in automation, sensors, and robotics. He has also served as PI for a number of NASA sponsored key projects in the development of aircraft mechatronic de-icing systems that was commercialised by the aerospace industry. Currently, he is a PI for a municipal key lab in reconfigurable manufacturing, and for an innovative team project concerned with the sustainable manufacturing of auto parts.